GLOBAL AWARENESS 101 - Let your VOICE be heard and get involved. OUR future depends on it! : Jesus Shows Great Love And Mercy To A Woman Caught In The Act Of Adultery By Religious Leaders Who Used Her Sin To Try To Trap Jesus. Jesus Shows Great Love And Mercy To A Woman Caught In The Act Of Adultery By Religious Leaders Who Used Her Sin To Try To Trap Jesus. Jesus returned to the Mount of Olives, 2 but early the next morning he was back again at the Temple. A crowd soon gathered, and he sat down and taught them. 3 As he was speaking, the teachers of religious law and the Pharisees brought a woman who had been caught in the act of adultery. They put her in front of the crowd. You may like to read John 8:1-11 before working your way through the lesson below. This is the account of the woman caught in the act of adultery, whom the Pharisees brought to Jesus when he was teaching a crowd of people. In this lesson, I am interested in five elements of hypocrisy and injustice evident in the account, and how Jesus coped with such hypocrisy and injustice, in order to help this undefended woman. The first and most obvious question one asks after reading this account is, "Where was the man?" There are four parties in this account: Jesus, his audience, the Pharisees, and the woman. There should be a fifth party: the man. Yet he is not mentioned! If the woman was caught "in the very act" (John 8:4) was not the man also caught at the same time? Why is the woman accused while the man is not brought to account? This is a case of man opressing woman. It is that simple. And it is so disgusting. There are people who look for loopholes in law so that they can do the wrong thing "legally" and who exploit law to their own nefarious ends. Such were the Pharisees. They were not engaged upon an honest campaign against adultery. 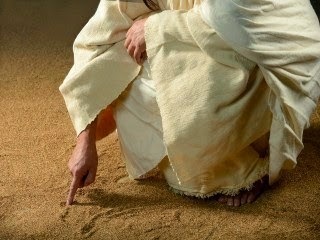 They were seeking "grounds for accusing [Jesus]" (John 8:6). Now notice their hypocrisy: They held that a man could divorce his wife for any cause, just by writing a certificate and giving it to her. Then he could marry another woman. This was "legal" and therefore was right in their eyes. But Jesus, after another occasion when they were testing him, stated that "whoever divorces his wife and marries another commits adultery against her" (Mark 10:2-12). So these Pharisees pretended to be outraged at this woman's adultery, whilst finding a supposed loophole in God's law to legalise adultery when it suited them. Almost daily we experience some criticism or accusation against ourselves by people who cannot see their own faults. The Pharisees were masters at this form of injustice and hypocrisy. Jesus, in his sermon on the mount, compared this with trying to take a speck out of your brother's eye when you have a log in your own (Matthew 7:1-5). But on this occasion, when the woman caught in adultery is thrust before him, Jesus chooses to utter no condemnation himself. He says only, "Let him who is without sin among you be the first to throw a stone at her" (John 8:7). Nobody was willing to take that position, not even one of the elders. In fact the elders were the first to leave as, one by one, the congregation dispersed. In some cultures, public shaming is used as a form of punishment, but Jesus did not participate in the public shaming of this woman. In fact he appears to ignore the woman and her accusers, and stoops down to write with his finger on the ground. When pressed he shamed them all, yet without exposing any of their sins to public scrutiny. Jesus, who himself was going to be publicly shamed, was not a believer in public shaming. He commanded us to deal with sins in private, with dignity and due process. We are to bring them into public attention only as a last resort, and in a responsible manner, giving the accused every opportunity for repentance (Matthew 18:15-17). The difference between the way the Pharisees treated this woman and the way Jesus treated her is obvious. They treated her with hypocrisy and injustice. Jesus treated her with mercy. He, uniquely, had every right to condemn her, because he, uniquely, was without sin. Yet he said to her graciously, "Has no one condemned you? Neither do I. Go and sin no more" (John 8:10-11). The difference between The Pharisees and Jesus was that they "neglected the weightier matters of the law, justice, mercy, and faithfulness..." (Matthew 23:23). If we learn nothing else from the experience of the woman caught in adultery, at least we should learn to treat and judge others without hypocrisy, but graciously and humbly, with justice and with mercy.